What a busy day yesterday was! We’re so grateful to those of you who have already Liked our Facebook page and followed us on Twitter (@sophiesstory #helpsophie). And the support we received on day one – with donations from people we know and many we don’t – is incredibly moving. We’re reading every message. While we still have such a long way to go – as of first thing this morning we’d raised £25,000 – people’s support yesterday leaves us with some hope that this impossible task is actually achievable. We took Sophie for her CT scan at Frimley Park Hospital yesterday. Despite everything she’s going through she remains incredibly strong – a true inspiration. 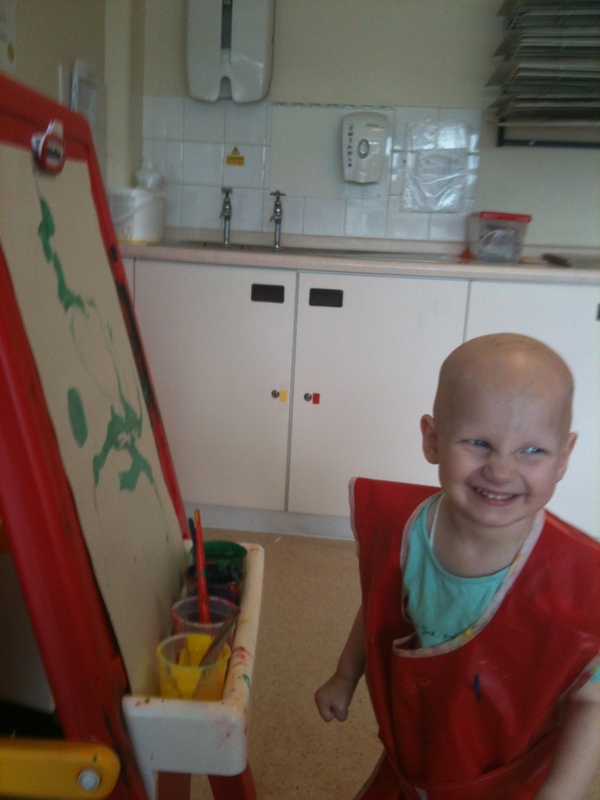 We should also point out that despite having to deal with all the tests and scans, she’s still her mischievous self! She managed to spray paint all over the playroom and get it on her hands and clothes, and then blew a raspberry at the doctor! It was nice to see her having fun and being distracted from the fact she couldn’t eat or drink until after her scan. Thank you for visiting our site, and thanks once again for your support.